WE OFFER THE PENNSYLVANIA STATE EMISSION TEST. WE ALSO DO THE NEWEST "CAN" EMISSION TESTING. OUR CURRENT FEE IS $39.95 FOR 1975 TO CURRENT YEARS. PASS OR FAIL. 1975 TO 1995 WILL GET A VISUAL CHECK (MAKING SURE ALL FACTORY INSTALLED EMISSION DEVICES ARE STILL INSTALLED) AND A GAS CAP TEST. 1996 TO CURRENT WILL GET THE OBD CHECK (ON-BOARD-DIAGNOSTICS, YOUR VEHICLES COMPUTER CONFIRMING ALL EMISSION DEVICES ARE WORKING) AND A GAS CAP TEST. IF YOUR VEHICLE FAILS, YOU WILL GET ONE FREE RETEST AFTER THE REPAIRS ARE DONE, UP TO THIRTY DAYS AFTER THE INITIAL TEST. DO BE SURE THE REPAIR IS DONE PROPERLY, THE COMPUTER'S CODES ARE CLEARED, AND YOU PUT SOME MILEAGE ON IT. IF YOU DO NOT, CHANCES ARE YOU MAY STILL FAIL. WE CAN SERVICE YOUR VEHICLE HERE PROPERLY. IF YOU DRIVE YOUR VEHICLE LESS THAN 5000 MILES IN A CALENDAR YEAR / 12 MONTH CALCULATED PERIOD, WE CAN ISSUE YOU AN EXEMPTION. IT STILL GETS A STICKER RECORDED THRU THE EMISSION MACHINE, JUST NOTHING IS REQUIRED TO BE INSPECTED. OUR CURRENT FEE IS $29.95. PLEASE BE PREPARED WITH YOUR PROOF OF MILEAGE DRIVEN. PLEASE NOTE: WE DO NOT CURRENTLY OFFER THE CHOICE OF A WAIVER. BE AWARE IF YOUR VEHICLE IS 1996 OR NEWER AND YOU HAVE A “CHECK ENGINE”, “SERVICE ENGINE SOON” OR OTHERWISE ON, IT MOST LIKELY WILL NOT PASS THE TEST. YOU CAN HAVE THIS ADDRESSED BEFORE TAKING THE TEST. YOU SHOULD PLAN THIS BEFORE YOUR CURRENT INSPECTIONS EXPIRE ... WE CAN DO THIS FOR YOU TOO !! CHECK US OUT ON THE PA WEB SITE !!! CLICK HERE FOR A COUPON FOR THIS TEST!!! PLEASE NOTE; YOU CAN HAVE YOUR CAR INSPECTED THREE MONTHS BEFORE YOUR CURRENT INSPECTION EXPIRES. PLAN AHEAD. DON'T WAIT TILL THE LAST DAYS AND EXPECT YOU WILL ALWAYS PASS AND GET TO LEAVE WITH VALID STICKERS. CARS THAT DO NOT PASS THE EMISSION TEST DO NOT GET EITHER AN EMISSION STICKER OR THE SAFETY STICKER. IT'S THE STATE LAW. FYI; AGAINST POPULAR MIS-BELIEF, YOU DO NOT LOSE THE INSP STICKER MONTH WHEN YOU DO IT EARLIER. IF WE INSPECT ONE DUE JANUARY IN NOVEMBER, IT GETS ONE DUE THE FOLLOWING JANUARY. SAVE TIME AND MONEY, RENEW YOUR REGISTRATION ON-LINE. YOU CAN PAY WITH A CREDIT OR DEBIT CARD ON THE PENNDOT WEB SITE AND SAVE THE POSTAGE. BETTER YET, IF YOUR'S EXPIRED IT WON'T COST YOU THE NASTY INSTANT OR ON-LINE NOTARY FEES THEY CHARGE. PLUS YOU NEVER LEAVE HOME TO DO IT. CLICK ON THE PENNDOT LOGO OR THE LINK ON OUR "LINKS" PAGE. PICK DRIVER SERVICES & RENEW. DON'T FORGET TO PRINT THE 10 DAY TEMPORARY PAGE IT DISPLAYS! WE ALSO NOW HAVE THE BEST IN DIAGNOSTIC TOOLS. WE GOT IT !!!! WE ARE ONE OF THE FIRST IN THE COUNTRY TO HAVE THE NEWEST AND BEST YET " SNAP-ON TOOLS, VERUS " DIAGNOSTIC COMPUTER. THIS GIVES US ACCESS TO INFORMATION THAT MOST DON'T HAVE, EXCEPT MAYBE YOUR VEHICLE SPECIFIC DEALER. 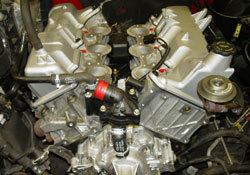 WE ALSO USE SNAP-ON'S SHOPKEY INFORMATION SERVICES AND SHOP MANAGEMENT PROGRAMS. ALWAYS AS UP TO DATE AS SNAP-ON IS. THIS GIVES US THE MOST COMPREHENSIVE INFORMATION AVAILABLE TO ANY INDEPENDENT REPAIR STATION OUT THERE. WE CAN SEE SAFETY RECALLS AND TECHNICAL SERVICE BULLETINS, PLUS ALL YOUR OEM REQUIRED MAINTENANCE SCHEDULES. DO YOU KNOW WE CAN SERVICE YOUR MANDATORY MAINTENANCE REQUIRED TO SUPPORT YOUR FACTORY WARRANTY. IF YOU DON'T DO THEM, THEY WILL NOT HONOR THE CLAIMS. DOES YOUR STATION UTILIZE THIS? ASK. A COMPETITION STATES, "WE FIX WHAT OTHER'S CAN'T". THAT IS BULL. WE FIXED WHAT THEY COULD NOT!! I TRIED THEM WHEN WE DID NOT HAVE THE TIME ON OUR OWN PROJECT CAR. THEY TURNED THE JOB INTO A MONEY PIT, THEY RIPPED US OFF! THEY NEVER FIXED IT, JUST LIED TO US THEY FIXED IT, AND I COULD NOT EVEN DRIVE IT OUT OF THEIR LOT. THEY CHARGED US OVER $700(LABOR, NO PARTS, AND DID NOT KNOW WHAT THEY WERE DOING), AND ALSO DAMAGED OUR CAR. THANKS "ALLENTOWN DIAGNOSTICS". WE HAD TO SPEND A LITTLE TIME LATER, AND CORRECTED IT WITH A SIMPLE FIX, THE WIRING WAS BAD TO THE INJECTORS. WE GOT WHAT IT TAKES TO DO THE JOB RIGHT, THE RIGHT WAY. DO NOT BELIEVE THE IDEA IT STILL RUNS "OK", OR IT DOES NOT SEEM TO RUN ANY DIFFERENT. DO YOU KNOW HOW MUCH FUEL YOU WASTE, OR POWER YOU LOSE, WHILE YOUR CHECK ENGINE LIGHT IS ON? IT COSTS YOU LOTS OF MONEY, EVEN MORE THAN THE FIX CAN BE. WITH THE EMISSION PROGRAM, THIS MUST BE FIXED. WE ALSO NOW DO COOLING SYSTEM EXCHANGES. THE BEST ANTIFREEZE “OUT WITH THE OLD AND IN WITH THE NEW” !!! DON'T DESTROY EVERY COMPONENT YOUR ANTIFREEZE TOUCHES. IT DOES NOT LAST FOREVER. THE GOOD OLD GREEN FLUID LASTS FOR 3 YEARS OR 36,000 MILES. MOST PEOPLE DRIVE THAT EVERY TWO YEARS. WE USE ONLY VIRGIN, NEW FLUID, NOT QUESTIONABLE RECYCLED STUFF. ASK ABOUT REPLACING WITH A BETTER, LONGER LASTING TYPE. DO NOTE CRUDDY, NEGLECTED SYSTEMS WILL REQUIRE MORE ATTENTION, AND COST, OF COURSE. DO NOT BELIEVE THE SAYING "DON'T FIX IT IF IT AIN'T BROKE". DID YOU EVER PAY FOR A COOLING SYSTEM NEGLIGENCE ONCE IT WAS TOO LATE? THE REPAIRS ARE NOT CHEAP, THE MAINTENANCE IS. WE ALSO NOW DO FUEL INJECTION CLEANING SERVICE. PROBABLY THE MOST IGNORED SERVICE REQUIRED ON CARS TODAY. WITH THE DEMAND YOU HAVE FOR PERFORMANCE, AND THE ESCALATING GAS PRICES, THIS IS VERY IMPORTANT. REMEMBER THE OLD DAYS WHEN CARBURETORS WERE NIGHTMARES? IMAGINE HOW ONE PER CYLINDER, LIKE MOST INJECTORS ARE, WOULD ACT. THEY NEED TO BE CLEANED REGULARLY FOR MAXIMUM PERFORMANCE, AND FUEL ECONOMY!! YOUR CAR IS SERVICED, RUNNING ON OUR MACHINE WITH DETERGENT CLEANERS FOR OVER 1/2 HOUR. THIS IS NOT A SILLY ADDITIVE DUMPED IN YOUR GAS TANK THAT GIVES YOU THE FALSE FEELING OF POWER. OUR CUSTOMERS PROVE THIS WORKS. DID YOU EVER PAY FOR A FUEL SYSTEM NEGLIGENCE ONCE IT WAS TOO LATE? WE ALSO NOW DO SMOKE MACHINE DIAGNOSTICS. HAVE A HARD TO FIND ENGINE VACUUM LEAK, EXHAUST LEAK, WATER LEAK OR EVEN EMISSION EVAPORATIVE LEAK? ASK ABOUT THIS NEW TECHNOLOGY. WE ALSO NOW DO TRANSMISSION FLUID EXCHANGES. THE BEST TRANSMISSION FLUID “OUT WITH THE OLD AND IN WITH THE NEW” !!! AVOID VERY EXPENSIVE TRANSMISSION REPLACEMENTS. A LOT OF PEOPLE DO NOT KNOW THIS SERVICE IS REGULARLY REQUIRED. OR THEY THINK IT IS TOO COSTLY. JUST PRICE YOUR TRANSMISSION REPLACEMENT. YOU WILL BE SHOCKED HOW MUCH IT COSTS. WE DO OUR SERVICE WITH HIGH QUALITY, SEMI-SYNTHETIC ATF+5. IT WILL GIVE SUPERIOR PROTECTION TO ALL TRANSMISSION FLUID TYPES. DID YOU EVER PAY FOR A TRANSMISSION NEGLIGENCE ONCE IT WAS TOO LATE?